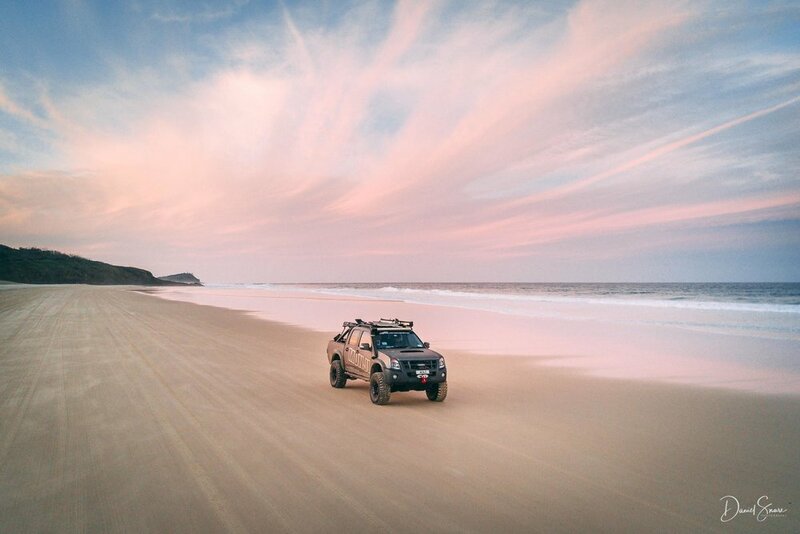 Recently Jared from Munji 4x4 came to me with a brief - Photograph the daily events of the annual RC Colorado Group camping trip to Fraser Island as well as capture some new marketing shots of the Munji Rig as it had recently undergone some visual and mechanical modifications. Day 1: The trip started really early (2am to be exact) from Munji HQ. This allowed us to catch one of the first barges across to the island so the group could travel at low tide. Luckily for us the 400 or so klm’s rolled past fast and in a matter of moments we were at our campsite setting up ready for the big week ahead. Day 2: Everyone was up early, excited that we were all on the biggest sand island in the world. For some in the group it was their first time on the island, so Eli Creek was the first landmark to experience. We headed down and cooled off in the fresh crystal clear water for a couple of hours. With the stresses of city life washed away, a small group of us headed north to capture some fun images of the vehicles going through the famous Ngkala Rocks. With a couple of fun runs under our belt and a few hundred images captured it was time to get back to camp. Day 3: With a quick group chat about the day's events out of the way, we jumped in the vehicles and headed north again. The plan, make our way to Sandy Cape at the very top of the island. In my eyes, this place is special because very few are able to make it this far. The remote location offers un-touched white sands which were perfect for a shot I had in mind. We started playing with speeds and angles to get the sand effect I was after. The end result was exactly what we’d hoped for, even though at one point I got coated in sand! Day 4: The halfway mark for the trip was here already and the group had something fun planned for the day: Lake McKenzie! The lake sure is one of the prettiest and most photogenic places I have been to, but for some we had seen it more times then we can remember. 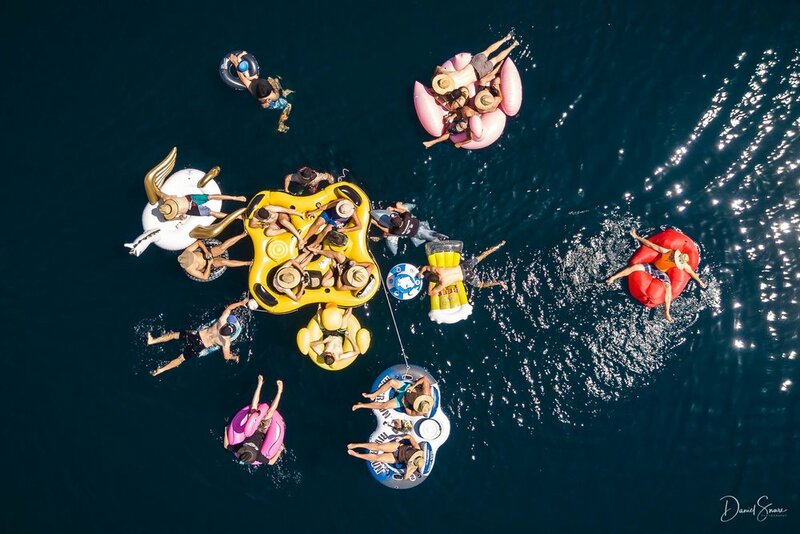 So, time for something just a little bit different, float out in some fun looking inflatable toys as far as we dared. For me this was a challenging experience. A bag full of cameras and a drone balancing on the edge of a blow up toy. However, to get great shots sometimes you have to go where no one has gone before! Day 5: The week so far had been fantastic, plenty of laughs, great weather and some incredible photographs. For the newbies to the island Champagne Rock Pools were calling. The previous year I had taken some really great adventure photographs at this location. That morning however didn’t get started as early as we had hoped and by the time we arrived the tide was high and all hope for some great photos was out. Not to worry, camera aside everyone got in the water and had some fun in the surf. With the shutter count low for the day I decided to re-focus, the afternoon's sunset was the time to get inspired. Location picked and a variety of shots planned out it was now just a waiting game for the sky to get painted a beautiful pink and orange. This also gave me the opportunity to send out my new DJI Mavic Pro drone. Later that night the stars had aligned and the Milky Way was set to be directly above us without a moon to wash it out. This was the perfect opportunity to capture the rig in the spectacular openness of nature. Final day: Unfortunately the week at this amazing place had come to an end. Once again the tides dictated when to travel, which saw us packed and heading south to the barge by 9am. Everyone had such a fantastic time; with memories created and the soul repaired. I often reflect on these weeks away and realise how fortunate I am to have the opportunity to go on these trips to create images that truly capture the brand. Both Munji and I are very happy with what we captured during our week on Fraser Island.